Home > How to buy Spanish ham online. Is it safe to purchase in Internet? Why to buy from Jamonarium ? Because we closely monitor the entire process from the raw meat selection, the curing, the preparation and the delivery to your home. Because we like and enjoy this job and we are the second generation who are ham specialist. Because when you order a ham, we selected for you the best product in the right curing stage. Because we carry out the whole process for all the products ourself. If you want boneless ham, we bone it; if you want sliced ham, we cut it and we vacuum-packed it for you. Because we will send you the order in the minimum time with a reliable shipping company. Because we answer your questions and doubts honestly and with total transparency. We want you to have all the information clearly and quickly. Because if you want to know who we are and how do we look like, you can come and visit us in our shop in Barcelona Pg. Sant Joan 181. What if I have doubts about the products or the purchase process? Search for the answer in the help area (More info) of in the website, where you'll find nearly everything that we thought would be useful to you. Send us an email to info@jamonarium.com with your questions or comments. Chat with us via our chat in the right bottom corner of our website. Call us by telephone from Monday to Friday, from 9h-18h Spanish time. English spoken!!! or send us a mail for us to call you. Hang your question on the Facebook wall or send us a message. How to make my first purchase? First you have to add to your cart the products you want to purchase. SUMMARY: Here you have the content of your cart. At the top you can see the steps you will follow to complete the purchase. Here you can change the quantity of your products. See also reflected the shipping cost to your country or by default Spain. This will change when you introduce the address. LOGIN: If this is your first purchase you must login filling up the form. If you've purchased before, you will only have to enter your email and password. Fill the delivery ADDRESS: By default you will have the same shipping and billing address. If you change any of them you must click on "Update." You can also leave some comments regarding the shipment. You can have more than one address for the same account. Choose SHIPPING company: You have to read and accept the "Terms of service" and select the courier company. Choose PAYMENT method: You must select a payment method. Depends on your choice, you will have to enter the required data. When we receive your order we will send you an email confirmation of your purchase. No, you can add the products to your cart and checkout as a gest. If you fill in the password field you be able to to enter into your account whenever you wish or wherever you are. This account will store the products you added to your cart, which you can remove from any time. Is it safe to register personal information online? The data entered remain registered in our database of our server, which are protected by the data protection law LSSI and LOPD. (See data protection). Whether by law or ethics, we can not and will not provide personal information to third parties. Regarding the bank details of the credit card, the process is continued directly between the banks. In no case do we have access to this type of data. When you enter the credit card number, it is done from the bank's website, never from our page. The SSL security certificate (Secure Socket Layer) security protocol aims to ensure the transaction of secure data between our web and the visitor browser program, or vice versa, by encrypting the information. SSL certificate encryps the data sent between the server where the site is hosted and browser software used by the visitor, or vice versa, using mathematical algorithms. With this encryption your data transfer is safe. Our SSL certificate allows a data encryption up to 128/256 bits. Once you view the product you want to add, click the "Add to cart" button and this will be inserted in "My Cart". If there is no stock of the product, please contact us and we'll inform you when we will have it again. First go to "My Cart". You will see the products you have added. Click on the "Trash" or "Delete" to delete. The product will disappear from the Cart. You can also write the quantity 0. How do I change a product quantity in my cart? If you want to change the quantity of a product, click on the button "+" and "-" to decrease or increase the units of the product. You can also write the exact quantity. What if you have questions about shipping? Visit the Shipping Information. Here you can find the cost and times of your shipping. If any other question contact us. How much does it cost to send an order to your country? Visit Shipping Rates. Shipping Rates. We work with reliable international delivery companies. What happens if you receive a wrong product or it is damaged? It will be changed or refund. Visit Money Back Guarantee. There are three payment methods on our online shop. All of them are completely safe. You need to introduce your credit card number, the card expiration date and the card validation code (CVC). All credit card transactions will be done through the Secured Payment procedure. Once you've entered the data into the step "Payment" of the buying process, our bank will automatically contact with yours to confirm the authenticity of the transaction. We work with the 3D Security to prevent fraud or stolen cards cloned. That means that at the end of the process your bank will ask you to identify with a code from a card, or a code send to your mobile. This methods depends on the bank and has to be activated. Mode of payment by a Paypal account where you have a credit and you can use it to make payments online. It is also completely safe. If you choose the option to pay by a bank transfer, you will receive an email with our bank account details and the amount you have to transfer. With this information, you can order a bank transfer to our account. Your order will be shipped at the time your transfer arrived at our bank account. If the transfer is from a foreign bank it may take 3-5 additional days for international accounts. Spanish accounts 1-2 days. Is it safe to pay online in jamonarium.com? 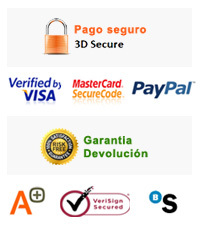 The payment of our online shopping process is completely safe. That’s to say: 100% safe. All the data follows an encrypted protocol during the whole transfer process, assuring a fully safe payment process. With the 3D Secure Payment mechanism we use, there is no possibility that your card number can be used by another person, because you always have to confirm the transaction through the mentioned 3D Secure Payment mechanism. The card details are only viewed by the bank using a secure payment gateway. We only can register in our computer your personal data and shipping details, protected by the “Spanish and European Protection Data Law”. So we don’t see your credit card number, as it is only registered by the bank payment system. How do you know the payment process was ok? When your payment process is completed, our computing system will send you an email to confirm that your order and payment have been received successfully. If there any error we will notify by mail. When is the online payment charged to your card? The charge process will be the same as if you pay in a restaurant or in a standard shop on the street, according to the type of card you have. How do we know you have well received your order? You will receive an email as a confirmation of your order and payment has reached us successfully. If you have sent the order and payment and you don’t receive any email confirmation from us, please contact us and we’ll solve whatever the problem is immediately. How do you know when your order has been shipped? When your order is delivered to the courier company, we will send you an email for your information. Furthermore, we will give you an approximate date of arrival at your home or at the other address your have requested. How do you know that your order has not been delivered to a different or wrong address? When your order is delivered by the courier company, we will send you another email to confirm your order has been sdelivered at the delivery address, thanking you for your trust on us. If you haven't yet received contact us. Where is your ham now? When your order is delivered to the courier company we will send you an email with your order tracking code. With this code and a link to the website of the courier company you’ll be able to follow your order shipping process. Can you change the shipping address once the order has been sent? Once we have delivered the order to the courier company we cannot change the address. You can only cancel the order before it is delivered to the courier company.